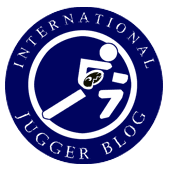 The international Jugger community is a huge bubbling cauldron. But there are always a few who stick out – they care more about the community and Jugger than others, they invest their time, they take responsibility, they are just all Juggers from head till toe, they gain competence and experience and let others profit from their knowledge, and, in the best cases, their wisdom, a feat that is widely underrated (and, often, lacking) but extremely important for any society. So why not dig out the good old term "Juggermaster", found in the movie near the end when Sallows team challenges a Red City Elite, to honour those who really care and work hard (and are also experienced enough to do so)? Not in terms of hierarchy, of course, but more as a visible reward. To make the choice a little more objective short guidelines are added – a reward of any kind always bears the chance of injustice to those who also work hard but get left out, so clear guidelines are important. The seasoned head of a big club is the Juggermaster, although many members might be as or even more active. Bad little world is it. I would say, a Juggermaster should be very experienced in every case: At least, say, 5 years of active training and of participation at Jugger tournaments, having organized a team, club, and/or tournaments, having mastered at least one of the five kinds of spars and knowing all others well, so that he or she can teach how to fight efficiently; having teached many others how to make each of the five spars (and knowing well what is important when making them) and the rest of the equipment. I created some symbols that can be ironed on jerseys or whatever, strictly reserved for those who earned them according to the definitions of course; see here (also included in the newest update of the free English Jugger book). Juggermaster (Club): The head of a stable Jugger group or club with more than one team and some years tournament experience. The chain not only represents the unique position in a team, but also the community that stands together – though it does this not necessarily in a row, not at all, but flexible like chain links. Juggermaster (Serenis): An undisputably extremely experienced Jugger who is an inspiration and a “sage” for the community. Examples: Adam (Brisbane /AU), Siggi (Hamburg/D). The cogwheel not only represents a driving element of the community, but is also a reminiscence to the atmosphere and, also, the crude, non-standartized currency in the movie. Jugger Zero or Juggermaster Zero Founder: One of the very few who introduced and established Jugger in a country. Examples: Mark Hill (Ir), Lester (D), First Ones of HH/KH (D), the predecessor of Adam (+; AU), Ruben (S). The Radioactivity symbol represents the atomic apocalypse, which is the base of the movie. Without it, there wouldn’t have been a Jugger movie and, therefore, curiously even today’s Jugger roots in that apocalypse. David Webb Peoples: The First One. He invented Jugger from scratch. He is our ultimate icon.